Well, well, well... I committed the crime. An open source developer attending a Microsoft event is definitely a crime. But then they promised it was going to be an event for PHP development on Windows. I took the bait, hook, line and sinker. Damn!! Promised : Build an end-to-end, authentication and authorization model for your existing PHP application in less than 30 mins. Delivered : An existing PHP application was taken, authentication provided by removing anonymous access from the root directory, and authorization provided by adding a login page. Quite a good demonstration , I would admit. With a few clicks of mouse, we could achieve something which takes a few lines of code. My Take : To a hand coder like me, who needs to have control on all the stuff going around me, I don't think I will ever use this stuff. Promised : Access your data exposed from your PHP app, through a RESTful service interface. Delivered : This is where I dozed off. The demo was to show how you can easily configure a webservice for a SQL Server DB, plugin your CS code to harvest this code and show it through your browser. My Take : Now, I may be snoring while they showed how the PHP application comes into the picture, but I have no memory of any PHP code being shown in this session actually. It was all about how to use standard plug n play snippets in Visual Studio, ADO.NET and SQL Server. Promised : Configuring Windows to run your PHP applications. Delivered : They showed us some so-called cool GUI configuration techniques for porting .htaccess configurations. My Take : Now why would I do that? When I have a single .htaccess file to control all my apache configuration, why would I monkey around with the superfluous click-and-you-are-done controls in IIS? And the best part of the presentation was that the guy showing this all leads the PHP UG in Bangalore. What a sham! Promised : Discover the web designer in you, to build pure CSS based PHP websites. Delivered : A couple of CSS tips and tricks downloaded from the net. And a huge demo of how Silverlight can Light up your web apps. My Take : No discussion what-so-ever for using CSS for PHP templates!! Cummon!! Atleast stick to what was promised in your mailer. But then MS is never known to stick to its promises, is it? Overall, I think that if they had called us in for a demo of what MS is doing for the Web Developers, then I would have definitely loved the sessions. I have never worked on MS stuff for web apps development and I would have loved to have a kick start. But I went there with a differend picture in mind, and was deeply disappointed by the way in which the MS guys used the name of PHP for promoting their products. Back in the 1990s, the web was dominated by static websites. The first graphical web browser , Mosaic, was launched by in December 1995 by NCSA. Its main achievement was that it was also the first browser to display images inline with text instead of displaying images in a separate window. Though the web pages still remained static but more color could be added to them. This small advancement in the rendering of the web pages led to the frantic rush in development and selling of advanced browsers. People wanted the guys who made Mosaic to create proprietary browsers for them. Sensing the opportunity, one of the Mosaic developers, Marc Andreessen, founded the company Mosaic Communications Corporation and created a new web browser named Mosaic Netscape. To resolve legal issues with NCSA, the company was renamed Netscape Communications Corporation and the browser Netscape Navigator. The Netscape browser improved on Mosaic's usability and reliability - as well as boasting the then-impressive feature of being able to display pages as they loaded. Within a year or so, Netscape was the browser of choice for the Internet users. It had almost 90% user base covered. But then entered Microsoft's Internet Explorer 1.0, which was bundled free of cost with the Windows OS. This started, what is called, the first browser war. Both the companies, in a desire to outdo each other, started implementing more and more features to their browsers. But still the web pages were static. Netscape decided to put user interactivity to the web pages. They hired Brendan Eich to develop a scripting language that could interface with the server-side components. Tasked with this, Eich eventually decided that a loosely-typed scripting language suited the environment and audience, namely the few thousand web designers and developers who needed to be able to tie into page elements (such as forms, or frames, or images) without a bytecode compiler or knowledge of object-oriented software design. Well... well... well... look who is back!! Anyways, there are no readers to complain. So no apologies offered. Anyways, now to the main topic of today's post. I am converting this blog to the chronicle of my quest for the Semantic Web. Hope the world doesn't come apart before I complete my POC (What with the 2012 prophecy, you never know what's coming). I am an avid googler and swear by the Wikipedia, but a few days ago I was let down big time by the Google. I was to go to Ooty and was searching for suitable accommodation over there. Can you believe google gave me some 8470 results, out of which I read the first 20 but still couldn't get what I wanted. Anyways, I decided that these kinda queries should be answered in person and no google should be given the authority to dictate the beds in which I sleep in. However, all the while I was driving to Ooty, one thought kept troubling me. Why can't someone dig all the wealth of information in the blogs and user reviews out there and provide me with a simple choice of no more than 10 hotels/homestays each in a different price range and with the maximum number of favorable reviews in their range? This question is the ultimate frontier for Internet searching. Providing relevant search results have been the nightmare for all the search algorithm writers for over two decades now. Since the birth of the Internet, people have been collecting data on the cloud. How nice it would be to go through this huge amount of data and come back with the most relevant piece of information. All this and some more spiked me to do some more googling on such searching and voila! I came up with a new jargon "WEB 3.0". Well, not actually new, I had heard a lot about semantic and vertical searching and have dirtied my hands trying web page - scraping but had never given a serious thought to this so called "natural language searching". Now, lets take the most basic question : What is, or rather will be, WEB 3.0? Everybody has got his own opinion about what it will be, I also have mine. For me, WEB 3.0 will be a paradigm shift from what we know of the Internet as of today. I mean, 10 years down the line there won't be any website as we see today. What will be is a huge repository of data, which will be essentially user and community generated and we will be able to access the data in whatever format we like and we won't need a conventional computer to do that (anyways PCs will have shrunk to the size of a laser device mounted on our ears which can project images on any surface or play sounds from their ear buds). This data will be rendered in whatever format we like using our previous preferences and could be changed whenever we want to. Hmmm! Quite futuristic huh. Wait for another 10 years sweetheart. a. I want to go to a happy place. b. I would like to read a sad, romantic story. c. I would like to have delicious, Chinese, home cooked food. Now all these questions today are answered by searching for keywords from the existing pages. However, we are talking about a search in which the search engine crawls all through the blogs and forums and other community sites and get the reactions of people for the various options possible and then show the results. Whew! That's a huge requirement in itself. Now let us break this into a further smaller problems. The biggest issue here is how does the search engine understand the emotions portrayed by the web page? Most of the searches can be made easy if the pages can be ranked according to their EQ. To answer this let me ask another question: How do we gauge the emotional state of something we read? Simple! By looking at the keywords which our parents and teachers taught us to identify with certain emotions. Similarly if we keep a data base where in the search engine can refer to and find out the number of sad or happy keywords, then it can gauge the overall emotional state of the page. So one problem solved. Similarly I will try to tackle different issues as and when I get time and in the end we will have the model of a basic WEB 3.0 search engine. Finally the beleaguered Sun Microsystems has got a suitor. Oracle Corp. has inked a deal to buy struggling server vendor Sun Microsystems for $9.50 per share, representing a 42.0% premium to Sun's closing price of $6.69 on Friday afternoon. This deal is worth $7.4 billion, or $5.6 billion net of Sun’s cash and debt. What does it mean to us as a consumer? Now Oracle will own Sun's Solaris operating system, Java programming language, and servers and storage hardware systems businesses. Integrating its enterprise software products with now added server and Solaris OS it can provide a off-the-shelf ready-to-use product which you can buy, bring to your office, plugin to your network and voila! you are all set to start your applications on your server. These are exciting propositions. Oracle will be the only company with products like this, though IBM has its products on the same lines but the software products of Oracle have a greater demand. Oracle is predicting that it will generate $2.0 billion in profits for Sun two years after signing the deal, which is expected to be sealed this summer. So it seems to be a very exciting buy after all. Looks like Larry Ellison is going to enhance his riches manifolds. He has taken a bold decision and only time will tell whether it is going to pay. Hmmmm... so a Napster happened to the Pirate Bay, though in a new country and by a new Judge. The defendants Frederik Neij, Gottfrid Svartholm Warg, Peter Sunde, and Carl Lundstrom were all sentenced to one year in jail each and a fine to the tune of $3,620,000 is to be paid by them to the prosecutors. The plaintiffs had demanded over 100 million Crowns as damages!! 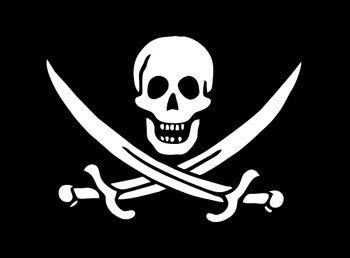 Now, coming back to the issue of Piracy, I really don't take sides. I am of the notion that every man who works hard has a right to his creation and sell it at a price he deems to be right. But what about the obscene amounts these entertainment industry guys charge us. Why should I pay for the 20 millions some jackass named Brad Pitt charges these studios? Or for that matter the 20 Crores Akshay Kumar makes for one single movie. Am I as a spectator at fault if I can't shell out the Rs 250 my local friendly PVR charges me for one show? Why won't I go for a cheaper(or shud I say free) version on the Pirate bay, Mininova, Demonoid or Torrentbox? Only if the shows were at a reasonable rate like Rs 50 or perhaps lower than that I would obviously go and watch the movie on a 75 mm screen and not on my measly 17" PC Screen. Lets take a hypothetical scenario : Movies are available for 1$ each for download from the net, using the same technologies. Will you then go for a pirated version? I won't!! The cost of any ones conscience is always more than a dollar. This is simple economics and I don't know why these guys don't understand this. Why bleed billions of Dollars to new technologies when you can actually earn millions from it? Instead of being steadfast on not lowering the prices, these studio bosses should acknowledge the advent of technologies and smartasses who use them (or abuse them depending on which side you are on) and understand the new demand and supply conditions. Gone are the days when you can only watch new movies in the theater or wait it to be at least 3-4 months older so that your favorite TV channel broadcasts it. With the faster than light broadband speeds the movies are passed on the net even before you can properly spell the cast's names. The studio bosses should go in for differential pricing, the first three days should be at a premium of not more than $10. Then after the first weekend the prices should come down to $1. They don't have to maintain any servers or the huge bandwidth required by using the P2P distribution systems. All they need to do is to give a authenticated torrent tracker file for a dollar. And they also save money on printing discs and transportation. I sincerely believe this would be a highly profitable model. And if they don't heed to it then no Pirate Bay can save them. Everyday the technology and browsing speed is increasing in scope. We will have hundreds of new sites giving away these so-called copyrighted stuff for free on the net and they can't sue everyone. Already there are sites which promise IP cloaking for P2P connections. And surprise surprise... Pirate Bay is still up and running. Looks like they are not ruffled. They have safely moved their servers to Netherlands!! Someone needs to tell them to take a long hard thought at this age old saying "Lets make friends and not enemies". How to break Win XP password? This is one of the topics which I see frequently on any hacker community. So lets once and for all crack the SAM mystery. SAM (Security Accounts Manager) file stores all the user info and passwords of all the accounts of a computer using Windows NT family OS(Windows XP, Windows server 2003,etc. ).So if you can somehow get this file you can get the passwords. How can one find passwords from the SAM file? This file is locked to all users during the windows is running,so that you can't open it while you are working in windows. (Find out how you can use this file....Google dear friends). How to prevent people from cracking ur SAM file? i) Try to avoid password which are dictionary words. ii) Try to use special characters in ur password. iii)Try to add non-printable ascii characters to your passwords. Operating Systems form the heart and soul of computer systems. They are the set of programs which run the computer and help you process the data at such an incredible speed that it almost appears magical to everyone. Now for anyone to be able to hack into any system will love to know the vulnerability of the OS running on the system. And so must you all(as u are aspiring hackers, right!). So lets start studying about OS in detail. First and foremost study all there is to study about the basics of OS. The OS's may change but the concepts remain the same more or less. Then install an earlier version of Windows(98 or 95). Now don't stare at me like that! I know that windows is BAD in terms of security, however it is a hackers heaven. You can try out all ur skills as a practice test here before venturing out. Play up with the OS, tweak the settings,registries and the codes(Did I say codes?). Try everything you can think of don't worry about crashing your system(Windows are meant to crash anyways ). If you worry about failure then remember that failures are pillars of success (But try not to build only pillars without any hope to ever building the roof).This will give you thrill and the boost to move forward. Then go for the *nixes. Try to install all variants of linuxs that you can lay hands on (Don't worry they can be downloaded from the net free of cost). Read all the MAN pages religiously. Read all that you can find about UNIX and LINUX (including their fascinating history). Try out hands-on on all that you can on these OS. You will be a hacker in the true spirit of the word. Don't worry there will be more on this blog by me. Just be a little more active and post more questions. It will help us both. So guys now that we have learnt how to use the net for our benefit,lets move on to the next level. A hacker knows a number of programming languages.Those are his tools and believe me as there is a different tool for different situations, you will face situations where you find that you have to use a different programming language. ii) Thoroughly learn C or any of its variant(like C#, C++, etc.). By thoroughly I mean that you must be pretty good with programming big projects using this language, not just the "Hello World" stuff. iii)Learn a scripting language like PERL(this is what I know, love and recommend but who cares for my advice,EH!!) or PYTHON. There are others but I don't know them and how can I recommend anything without first using it. Google and search for tutorials. A lot of them will be there choose one that suits your style. Get source codes from the net(There aren't millions of them floating there, to be frank, but you can find some good ones there). Try to analyse them and tweak them for better output. Play with the codes a lot. When you think you are ready you can get projects on the net and try to finish them to the end. You will love it when you finish them. This is the end of todays topics. Any doubts,questions,suggestions are are welcome.Feel free to express urselves guys. So now that you know what is a hacker, don't you wanna know how to become one. I will tell you this in a step by step method. Everyday (or may be in two days,at the most,if I am busy) there will be an article as to how to become a hacker. The topics will be in an increasing order of intensity and interest. So I advice you to read them chronologically. Now this topic concerns How to start? This is the most frustrating part.You wanna learn something and there is no one to tell you how to do it.Don't worry I will give you an hint as to how to start. This is based on how I started and how most of "them" start. You may have heard that the Net is a vast ocean of knowledge. But howcome you have never found it. Its because you have never ventured into deep waters. Try to do it and use a trustworthy search engine as your helmsman. Try to search every thing and look out for new and interesting things which you may have never looked at. Searching the net for a particular piece of information is like searching for a needle in a hay stack. But don't worry. There are lots of tutorials on the net as to how to search properly. Google for it(this means search for it in Google, try to learn this expression as you will find it very frequently on the various newsgroups and forums). You can learn best in a peer to peer arrangement. So join forums and then search out for people who you think are almost at your level of learning and start sharing with them. And remember that you are new to the community so don't blabber anything which you are not confident about(Hackers have a very good memory and they don't forgive and forget mistakes). Now, this is the end of this post. I'll back with some good post tomorrow. Till then happy hacking!! You may have sometimes wondered "Who is a Hacker?". This is a study to tell to exactly what do u mean by a hacker. Let's start with two of the most famous and trustworthy definitions ever found. A hacker is a person who creates and modifies computer software and computer hardware, including computer programming, administration, and security-related items. In computer programming, a 'hacker' is a programmer who hacks or reaches a goal by employing a series of modifications to exploit or extend existing code or resources. In computer security, a hacker is a person able to exploit a system or gain unauthorized access through skill and tactics. This usually refers to a black hat hacker. There are also white hats (ethical hackers), and grey hats. In other technical fields, hacker is extended to mean a person who makes things work beyond perceived limits through their own technical skill,such as a hardware hacker, or reality hacker. I think this would be more than enough for you to know what is a hacker. However as every study has a conclusion I conclude by stating that a hacker is anyone who has got the zeal to pursue knowledge and has got the guts to give it all away. The best example (according to me) being Linus Torvalds.